Discussion in 'Canoeing / Kayaking, Boating, & S.C.U.B.A.' started by dfitzgerald727, Jan 14, 2018. I don't think that would work for us here in Florida. Too many gators that may want to take a grab at those fins. Really nice, lightweight set up, if it had some kind of floor, at least in the front, would be perfect. Update from 6 days later..... I noticed the annual 20% REI discount was available and went looking at the OruKayak, decided two of these were just too pricey so opted for a tandem inflatable with good reviews. Looking forward to the snow melting to check it out. Just a thought, I have a sea eagle 330 that is a ton of fun. stable and tough as nails, just not as quick as a hard kayak. I'd sell it for a fair price. Looks alot like our lntex Excursion, that's what we went with. Easy to pack...tons of fun. We often haul a 17' canoe on top of our Forester on our trips. I have a couple of lightweights, a 60 lb Grumman and a 55 lb Novacraft which are easily handled even by my 70-year-old body. I prefer canoes to johnboats for paddling. I could not carry my 12' canoe or fishing yak in the bed of my truck and tow the TT. I went to HF and bought a ladder rack, the rack carries 200 lbs and my canoe and yak weigh about 50 lbs. this works great for me I just lash which ever one I want to take, the brackets screw into the side of the bed and the upper parts drop into these brackets, I also drilled a hole in each bracket and insert a pin thru this for safety. I did have to move my tool box forward but that works great as I drop my camping table and pet fences between the tool box and the cab. has worked great so far. Yes it's not fast, it's not supper cool , but for a cheap way to get on the water to relax , it worked. Mine is 10 years old and still doing fine. It's been, in lakes , the Hudson, the ocean and inlets as well as bays. So it held up way better then I thought. This one has the cheaper seats, they work for me , but they do have a better model for not much more. Just a update to the above - we have used the tandem inflatable kayak above and love it! We use a 12v pump to get it 90% inflated and finished it off with a hand pump with built-in pressure gauge. Works great with 2 people! And easy to store in the back of the covered bed of the truck. Here is a great way to carry a boat on your pup, and it doesn't put any weight on the roof. Raycfe, hayyward, BillyMc and 1 other person like this. I like it! What I don't like is how much longer setting camp up would be. The guy that made the rack has a write up on it on another site that tells more about it. I think he said it only takes about 10 minutes to set up or take down. We went with the Intex Excursion 5 person inflatable for fishing on several lakes in the area. Dh is putting in a plywood bottom for stability and we got the trolling motor mount. I bring a 16ft Bell Chestnut Prospector RX Canoe. I carry it on roof of tow vehicle. Most user friendly solo or with kids boat to cover everything from lakes, bogs, rivers, and if brave unlimited HP big water. Planning to modify a pipe rack and add wheels to jonboat to carry on top of TV much like this. 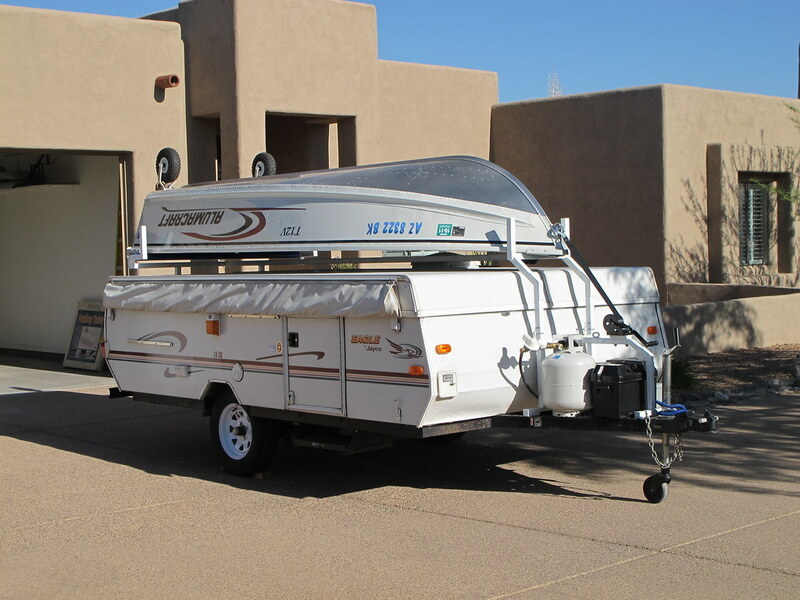 I don't want to have to unload boat before setting up the camper. Some multi-leg trips will have no need for a boat at certain stop, but can be used at others. DiamondGirl and hayyward like this. BillyMc, Please share pics when you do this project.